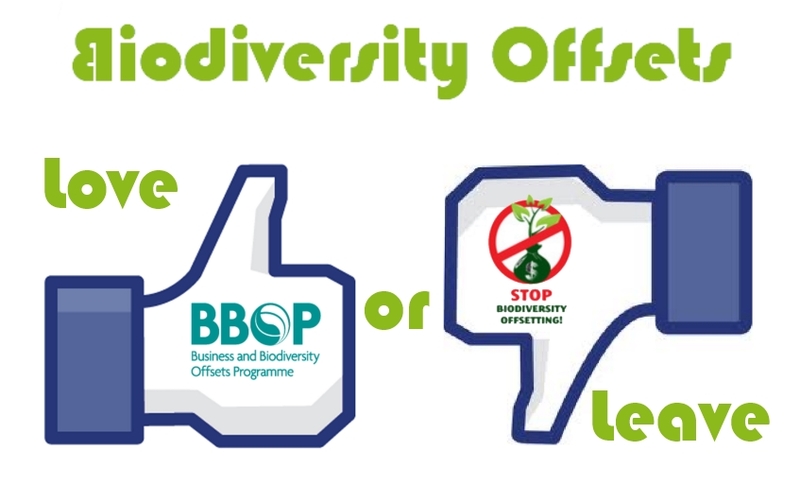 ← Biodiversity Offsets need a strong regulatory system! Or voluntary engagement? As bio­di­ver­sity off­sets become more vis­i­ble in the pub­lic they are sub­ject to a grow­ing con­tro­versy. Crit­ics of bio­di­ver­sity off­sets have a grow­ing lobby, espe­cially in the UK, where the gov­ern­ment seems to rush, want­ing to push through the con­cept of bio­di­ver­sity off­sets, no mat­ter at what expense and quality. Are bio­di­ver­sity Off­sets a License to trash? The “license to trash” crit­i­cism has resulted in var­i­ous writ­ings (e.g. by George Mon­biot in his col­umn in the Guardian), events (e.g. Forum on the Nat­ural Com­mons) and cam­paign­ing (No to bio­di­ver­sity off­set­ting), up to a recent mock­u­men­tary. Con­tro­versy: What dis­tin­guishes oppo­nents and pro­po­nents of Bio­di­ver­sity Offsets? The dis­tinc­tion between oppo­nents and pro­po­nents in the cur­rent dis­cus­sion comes done to a ques­tion of framing. There are on the one side the oppo­nents who argue from an eth­i­cal and moral (or even philo­soph­i­cal) per­spec­tive that bio­di­ver­sity can’t be mea­sured and val­ued in eco­nomic terms and by its very nature is irre­place­able and thus not offsettable. On the other side the pro­po­nents of bio­di­ver­sity off­sets take a more prag­matic view claim­ing that bio­di­ver­sity off­sets are inevitable when­ever devel­op­ment takes place. While cer­tainly both sides are mak­ing a point, nei­ther side has man­aged the issue so far: the first one is lack­ing to sug­gest solu­tions (while get­ting the big­ger pic­ture right) and the sec­ond is sug­gest­ing pos­si­bly weak solu­tions (that don’t get the big­ger picture). A weak point is that the dis­cus­sion about bio­di­ver­sity off­sets as a con­cept isn’t held in acad­e­mia, but more as a soci­etal dis­cus­sion – loaded with emo­tions and value judgments. It is cer­tain that bio­di­ver­sity off­sets con­cern many peo­ple. And there­fore it is good that the dis­cus­sion is held in pub­lic. But the “hus­tle and bus­tle of quickly picked argu­ments” that can be fre­quently observed doesn’t help very much. So, Bio­di­ver­sity Off­sets — whether you love or leave them — should become sub­ject of a “well-informed debate” instead. Leave (not love!) over sim­pli­fy­ing ecosys­tems — we don’t need more trees we need robust habi­tats and sys­tems everywhere!